IMU 003 : How a German Immigrant Gamed the System and Retired By 34! | Immigrant Masters Unite Podcast: Transform Your Business, Life and The World Around You! How to benefit from being an immigrant. Jack talks about a simple shift that can change the way you look at life and grow your business. How to overcome the language barrier that many immigrants struggle with on daily basis, especially in the business world. How our “immigrant filter” allows us to create new opportunities that other can’t see. How the “American Dream” view we hear everywhere can actually trap you and keep you away from being financially free. Top 2 biggest takeaways and secrets to success including a big pitfall that 90% of immigrants fall into and how to overcome it for good. 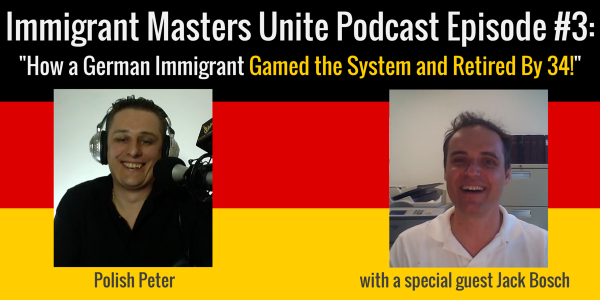 So, listen to this brand new podcast, Polish Peter’s first interview on Immigrant Masters Unite Podcast. Once you listen to the podcast, let us know in the comments below your thoughts, takeaways and suggestions. I would love to hear what you have to say.